FNN CELEBRATES BLACK HISTORY: FEB. 11, 2014. A female-raised Muslim by the name of Laila Ali, daughter of Muhammad Ali--the magnificent boxer, is my role model. She follows in her father’s footsteps by carrying on her father’s legacy. No one who actually knew her well would have thought that she would make the decision to become a female boxer. When she was younger, she kept to herself, but became boisterous and came out of her shell when she hit her teenage years. Now, she is a champion boxer as her father was. When she was eighteen, seeing Christy Martin win many boxing matches made her finalize her decision to become a famous boxer. Her father was upset by the news. But then she assured him that she’d be fighting her own gender and that his genetics were inside of her. Her first match was against April Fowler. She defeated that opponent, and after that came a winning spree of eight times in a row. The match between Freeda Foreman and herself was a hit because she won. And the match was the first pay-per-view match between two African American women. She won the IBA, (Internal Boxing Association) title with a second-round knockout of Suzzete Taylor on August 17, 2002. 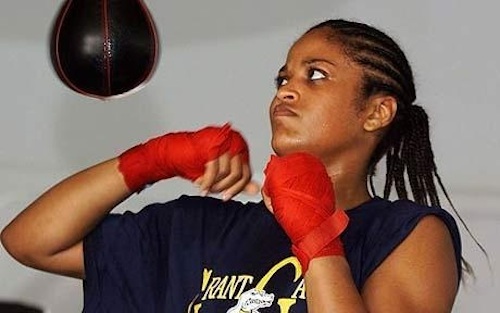 Although Christy was one of the best woman boxers, that all changed on August 23, 2003, when Laila and Christy fought, and in four rounds, a knockout by Laila occurred. Many people attend her boxing matches and many people love her. She has won many matches and inspired many people as well. She is no longer following her father’s religion-Islam, but is still a boxer. Laila Ali is my role model because she never gave up and is a strong and accomplishing woman. I and many other African American children are inspired by her. Even when she is boxing, she still adheres to a good personal life. Sadeeqa Shahbaaz is an eighth grade student at Friendship Blow Pierce Academy.